In this second edition of The Teaching Voice, the text has been extensively re-written in response to new developments within the growing field of occupational voice use. Much new research has been undertaken since the first edition was published in 1996 and there continues to be intense interest in the topic, with increasing evidence of the potential for vocal damage due to the demands of occupational voice use. It is intended for professional voice users; individuals who use the voice for the purposes of teaching or informing. It aims principally to address the needs of teachers and student teachers in infant, primary and secondary schools and to be of use to lecturers in the college and university sectors; dance, drama and sports instructors; public speakers in professions such as the clergy and the law; and those in commerce and industry whose professions require communication that is heavily dependent on the voice. 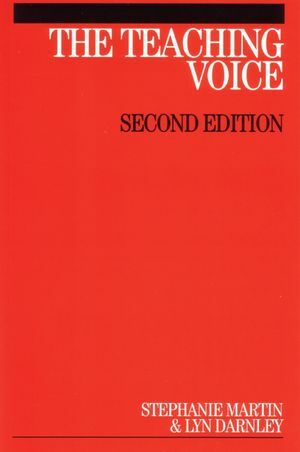 The aim of this book is to offer a mix of practice and theory, which will allow professional voice users to understand how the voice works, to explore some of the factors that influence voice production and most importantly, to offer readers strategies and solutions which will provide a framework to keep them in good voice throughout their professional careers. Stephanie Martin, Central School of Speech and Drama, UK and Lyn Darnley, Royal Shakespeare Company, UK. The Effects of Teaching on The Voice. The Effect on The Voice of External Stress Factors. How The Voice Works, Voice as a physical Skill. Suggestions for volume and Distance.